The ingredients: For every pound of pork, a pound of lard will be required for deep-frying; that is a lot of lard! The water and salt are added later. The first stage: The lard is melted in a copper cauldron; the melting temperature depends to some degree on the purity of the lard, but it occurs at a fairly low temperature, around 106°F (41°C). On the other hand, the smoking point of lard is quite high, averaging around 370°F (188°C). That means the temperature in the cauldron should be maintained below this high temperature, probably falling into the most efficient range for the Maillard reaction, which causes browning without caramelization, roughly between 280 and 330 °F (140 to 165 °C). Similar to deep frying a whole turkey, the large pieces of meat do not lose a lot of moisture because fat is hydrophobic (repels water) so, once the moisture from the surface has evaporated, the juices in the meat will tend to migrate towards the centre of the pieces. The second stage: Adding salty water not only seasons the pork, but it effectively reduces the temperature in the cauldron, since the water will heat up and absorb energy to evaporate, allowing the meat to finish cooking without burning. This will result in a tender centre, without losing the crispy exterior. That is a very efficient technique, honed for centuries by trial and error, and perhaps with some empirical knowledge of the chemical and physical reactions occurring in the cauldron. The only problem is the impracticality of such an intimidating amount of lard for today’s average household kitchens. To translate this perfected process into a method without deep-frying, it is important to note that the pork itself will initially contain a certain amount of fat when raw; following the trail of the recipe, if this fat could be rendered first, the resulting lard could then brown the meat in the pan. Other well known recipes use this principle, such as Chilorio (click here to check my recipe), and the rendering of lard for cooking and baking, in which a small amount of water may be added to the pot at the beginning of the process, to allow the pork fat to melt without browning or burning. This suggests that the first stage for Pan Fried Carnitas should be to cook them with a small amount of water, at a low temperature, so the fat will melt out of the pork, rendering lard without burning it. After the lard has been rendered, the pork will continue to cook without browning because of the water still present; when the meat is fully cooked, if this water is allowed to boil and evaporate, the lard will remain and, when the browning range of the Maillard reaction is reached, the pieces of pork will crisp and brown, similar to when bacon is being crisped in a pan, in its own rendered fat. In this way, the Pan Fried Carnitas will require just three ingredients: pork cuts with some fat (for example, shoulder, ribs, loin chops, shank), water, and salt (no lard at all!) One consideration is to cut the meat into pieces so that they may be cooked with a small amount of water at a low temperature, not so small that they will burn, and not so big that they will take too long to fully cook. Another consideration is that the amount of meat should be just right to arrange the pieces in a single layer in the pan, because overcrowding would cause the meat to steam instead of frying and browning at the end of the process. By cooking the meat first, the rendered lard will take care of the crisping and browning later, resulting in Carnitas with a tender texture, crispy exterior, and maybe with even less fat than at the beginning of the cooking procedure. Shredding Carnitas is not a popular practice in authentic Mexican restaurants and markets, probably because shredding would tend to produce pieces with either mostly the crispy exterior or the meaty centre, and will feel less tender with each bite. My batch of three pounds of meat was very tender and nicely crisped, but I thought the pieces were slightly crowded for the size of my pan; if I reduced the batch to two pounds, they would probably brown even crispier and more evenly. The right batch size then, will be greatly dictated by the diameter of the largest pan at hand. Finally, the perk of no added lard, definitely makes this recipe worth keeping. NOTE: Despite their name (carnitas means “little meats” in Spanish), cooking traditional Carnitas might be sort of a cultural experience, often involving a whole pig, which would include less fatty parts, such as organs, feet, and skin, for which the mandatory 1:1 pork to lard ratio (and hence, deep-frying) would probably have to be honoured. I was also immensely happy and thankful to find my post “Still Thankful – Four Ways to Enjoy Leftovers” featured in What’s for Dinner? 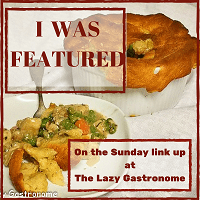 Sunday Link-up #177 hosted by Helen @ The Lazy Gastronome. This week, I am bringing my Carnitas to Helen’s wonderful party! They look yum! I use a similar method to make sweet and sour ribs. I love those ribs! It’s nice to learn that they are not deep-fried, thank you for your comment, Joy! I will certainly try that! Very interesting technique and well described. You are essentially boiling the pork before frying it, so it has to be good quality (marbled) pork to turn out succulent. So far I’ve only tried to make carnitas with orange juice and seasonings; next time I will try the traditional version with salt only. Yes, it is a little like the “reverse searing” for steaks, but using the pork’s own rendered lard; I think it should work as long as the meat is cooked slowly, and it is not too lean (e.g., centre loin). Orange juice, milk and/or herbs are traditional, too, it’s just that the simple version is one from Uruapan, Michoacán, kind of the cradle of carnitas. The ingredients that are not traditional are beer, Coca-Cola and condensed milk. I love carnitas – I love them fried and not fried – I love them as tacos, burritos or just on my plate. Thanks for sharing at the What’s for Dinner party – hope your week is great! Yes, me too: here and there, in a box, or with a fox … hee hee have a great week, as well, Helen! yummy. Really good. Thanks for this Fiesta Friday treat.